Elana Kahan joins Peter Reitzes to discuss what she wishes her speech-language pathologists (SLPs) had known about stuttering. Elana and Peter begin by discussing their strong concerns regarding informed consent for preschoolers who stutter (this topic was raised on StutterTalk episode 483). Then Elana is asked to look back at her childhood speech therapy and to discuss what she wishes her SLPs knew about stuttering. Elana share about her frustration with years and years of SLPs giving her fluency workbooks to practice her speech. Elana also remembers fondly a high school SLP who was a great listener and asked Elana what she wanted to work on in speech therapy. Peter discusses concerns about the “conspiracy silence” and how this may be made even worse when SLPs assign “fluency” tools to children without talking openly to the same children about stuttering. Elana Kahan, M.S. CCC-SLP is a person who stutters and a speech language pathologist in the New York City Department of Education. 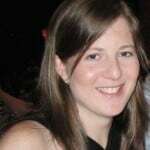 Elana is also the chapter leader of the long Island NY Chapter of the National Stuttering Association. When not at work, Elana enjoys spending time with her husband, 8 month old son, and crazy dog.